Nation states, asserts the world-renowned business strategist Kenichi Ohmae, are dinosaurs waiting to die. In this profoundly important book Ohmae argues that not only have nation states lost their ability to control exchange rates and protect their currencies, but they no longer generate real economic activity. As a result, he maintains, they have already forfeited their role as critical participants in the global economy. Once efficient engines of wealth creation, nation states today have become inefficient engines of wealth distribution, whose fates are increasingly determined by economic choices made elsewhere. Ohmae contends that four great forces -- capital, corporations, consumers, and communication -- have combined to usurp the economic power once held by the nation state. In the first full-scale analysis of this global phenomenon, Ohmae explains exactly how communications now control the movement of capital and corporations across national borders, how demanding consumers determine the flow of goods and services, and how harmful government policies are increasingly disciplined by the actions of informed consumers, profit-seeking corporations, and currency markets. Old habits die hard and the habits of power die hardest of all. While governments cling to jingoistic celebrations of nationhood that place far more value on emotion-grabbing symbols than on the welfare of their citizens, Ohmae reveals that within their borders a revolution has been born. He documents how affluent economic zones forming natural "business units" have arisen throughout the world, bringing real, concrete improvements in the quality of life. These new engines of prosperity, which Ohmae calls region states, have emerged, for example, between San Diego and Tijuana, Singapore and parts of Malaysia and Indonesia, Silicon Valley and the Bay Area, and Hong Kong and the adjacent portion of the Chinese mainland. 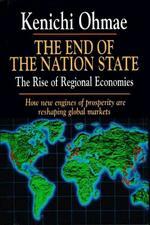 He describes how these region states, each inhabited by 5 to 20 million people, have closer links to other region states in the global economy than to their "host" nations, and constitute essential growing markets for the goods and services of global corporations. Ohmae concludes that the emergence of the region state changes deeply and forever the global logic that defines how corporations operate and how the governments of nation states understand their proper role in economic affairs. Managers and policymakers must remember that people came first, and borders came afterwards. This masterful analysis will redefine the workings of the global economy for generations to come.